Published: . Filed Under: home page, Surviving Kids. 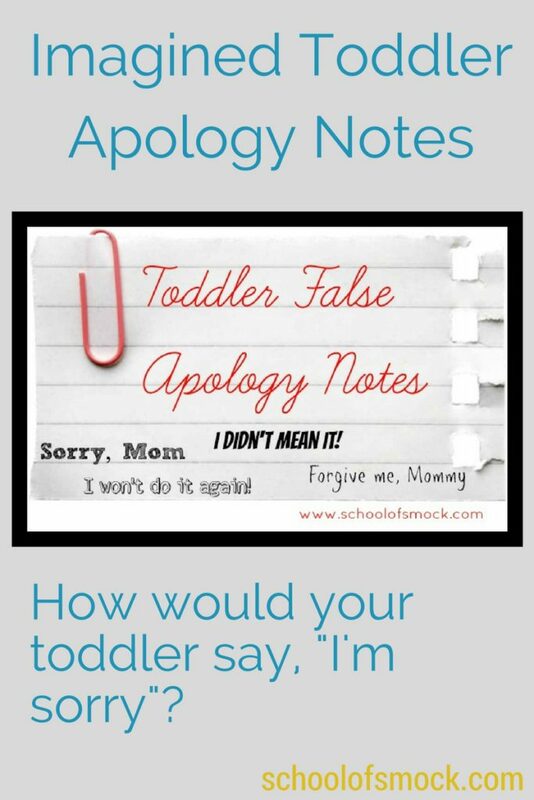 What would your toddler say if he or she could write an apology note for their toddler-like behavior? Back when I was an English teacher, my favorite writing unit was poetry. Every year I delighted in changing kids’ minds who walked in the door thinking that poetry was always boring, old, or too hard to understand. I loved to teach middle school kids to write poetry that came from their souls, that played with language, and that could make others laugh, cry, or think. Now that I’m a mom to a toddler and no longer teaching, I don’t think much about similes, stanzas, and personification. But I do wonder what my toddler son would compose — if, of course, he could write — if he learned about my favorite poem to teach kids: “This Is Just To Say” by William Carlos Williams. There’s so much going on in that poem, and that’s why it’s such a fun and accessible way to introduce poetry to kids. It’s deceptively simple, but does so much with line breaks and word choice. And kids love to learn that Williams was actually a doctor who came home very late one night, ate his wife’s plums, and left a note for her (this actual poem). Once children get that — it’s really about an everyday act that could happen in anybody’s kitchen — they take off with it, writing dozens of their own not-quite-apology poems, imitating Williams’ form and tone. Can you write your apology poem from your child? Wow! Thank you so much, Dawn! JD @ Honest Mom recently posted…It’s been five years of battling depression. And I’m really, really Tired. Thanks, JD! I could keep writing these poems all day! Oh, I’m so in love with this! nothingbythebook recently posted…Don’t fight with the four-year-old. Just don’t. That’s quite a compliment 🙂 Thank you! The one about Mickey Mouse KILLED me. That’s my 16 month old right there. My son has a very serious Mickey Mouse Clubhouse addiction. We will be anywhere and he’ll decide that he needs to watch it! I love this! Thanks PricklyMom for passing it along!!! I love it! Isn’t it so fun? Oh the things I hear that I’m sorry for… toddlers are fun, funny, and silly! What’s So Great About Sleep? OMG I’m laughing hysterically! “So sorry you got upset!” These are perfect poems for toddlers! Perfect perfect. I’ve been sitting here trying to figure out how to do a poem with “sorry I pooped in my pants almost every day” but need some time between now and writing. I love these, so much! Sarah @ LeftBrainBuddha recently posted…Just Dance! I would really like to kiss you right now. I know we haven’t met and it’s a little soon, but this…this is so so good. Thank you! Sorry About Last Night’s Dinner as to be my favourite one, although it’s a tough choice. That was brilliant,Jessica. OK seriously, tears are pouring down my face. You so hit the nail right on the head. I am not sorry for what I did, I am sorry you can’t handle it. Just so perfect. SO PERFECT! That’s exactly what I was aiming for. I like your summary: I’m not sorry and I’m sorry that you can’t deal with it. Thank you! Jessica recently posted…Do You Hate Fevers as Much as I Do? Yes, yes,yes and yes. This was FABULOUS! Though I need to think about it a bit mine would be something about throwing all my dinner on the floor and then wanting to eat it anyway. Brilliant brillant brillant! LOL. Love your funny side!!! Love it! Always liked that poem too…. if you made something good. I said I wasn’t hungry. Yes, that’s perfect! I should have mentioned that: the ability of toddlers never to be hungry at appropriate times! That is brilliant! I am poetically challenged, but I’ll try to come up with one of my own. The great thing about this poem is that it doesn’t require much poetic ability! Thank you! Love these! As a poet myself, especially love thinking about what my toddler would say. The site is looking great and I’m eager to check over to book’s new site too! I LOVE William Carlos Williams, and my favorite is the wheelbarrow one….but the plums piece is pretty sweet, too (pun intended). So funny!